Skin health is very important to your overall health and longevity. Plastic Surgery Services of Fredericksburg offers a variety of state-of-the-art skin care product lines, including the popular Obagi brand. Visit our Medical Spa page for more information about chemical peels, facials, body treatments, and other services. Unlike traditional skin care products that only treat problems on the surface of your skin, the Obagi Skin Health Restoration System works at the cellular level. Under the guidance of our trained physicians, the Obagi system helps to correct surface discoloration and blemishes, and it stimulates cell renewal to bring back the glow and softness of healthy, younger looking skin. The board certified physicians and staff at our fully accredited facility in Northern Virginia have completed advanced training in the latest techniques of skin rejuvenation that effectively correct problems that cosmetics can only cover up. The Obagi Nu-Derm System is for moderate to severe sun damage. It has been clinically proven to be the best prescription-based skin care system for the treatment of sun-damaged, pigmented, and aging skin. It penetrates skin to work at the cellular level. After practicing the skin conditioning program for 3 skin cycles or 18 weeks, the Obagi Blue Peel is an excellent procedure for skin tightening and reversing skin laxity. The Obagi Blue Peel is a light to medium chemical peel that increases your skin’s clarity and tightness. During the procedure, your physician actually controls the peel process and its depth, which is a major breakthrough over previous methods. We offer the Obagi Blue Peel in our Medical Spa. Get to the root of acne to clear your skin. CLENZiderm MD Systems contain a unique liquefied form of 5% benzoyl peroxide, known as SoluZyl Technology. Because it is liquefied, this medication can penetrate deeply and quickly into your pores for rapid results. Our patient skin care counselor can advise you whether CLENZiderm MD is right for you. For more information about Obagi products, visit the company’s website. 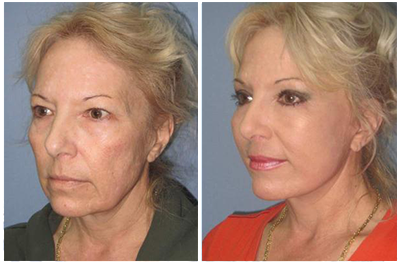 Visit our photo gallery for chemical peel before and after photos. Visit our Medical Spa and fees and financing pages for price information. We serve patients from Fredericksburg, Richmond, Fairfax, and beyond. If you would like to find out more about the skin care products offered at Plastic Surgery Services of Fredericksburg, contact us online to request a free consultation, or call our office at (540) 371-7730.